A Weakness For Raisins presents drawings, letters, photographs, props and handmade objects belonging to Czech screenwriter and costume designer Ester Krumbachová, alongside short clips of films she worked on, including 'The Party And The Guests'. A display of kitchen utensils and model foodstuffs divides the gallery, as does a large reading table covered with translations of Ester's written material. The space is filled with a cacophony of chimes and gongs punctuated by bursts from a cuckoo-clock. It's frenetic. Accompanied by a large amount of newly commissioned work and written material, this exhibition is thick with meaning, but Krumbachová's films are allegorical and playful, unravelling complicated social relationships with a light touch. There are no portraits of Krumbachová in her archive, instead the films reflect her sensibilities and approach. Degenerate women make regular appearances. In 'Daisies,' 1966, two nymph-like girls wearing glamorous lingerie cavort on a double bed, setting fire to things and romping about with naïve abandon. They carry out weird dissections of phallic foods; cutting a banana in pieces with scissors, spearing a gherkin with a giant fork and cutting out photographs of chunks of meat from a magazine and chewing them, all while listening to a male suitor professing love over the phone. In 'The Murder or Mr Devil 1970' the female lead character attentively serves her male co-star, humouring him even though she is much more intelligent than he is. He comes off badly having voiced too much of his lumbering self-absorbed thought process out loud. Completed in 1966, 'The Party And The Guests' was perceived as an allegory of totalitarianism and was banned for twenty years. Krumbachová, like other Czech artists, struggled to continue making work in spite of being excluded from film studios and blacklisted as politically undesirable. Her frustration is evident in her wryly cynical writing in which she describes being sidelined by others who take credit for her ideas. In spite of these obstacles, she clearly had enough self-belief and creative flair to explore her precarious position as an outspoken, strong-willed woman. 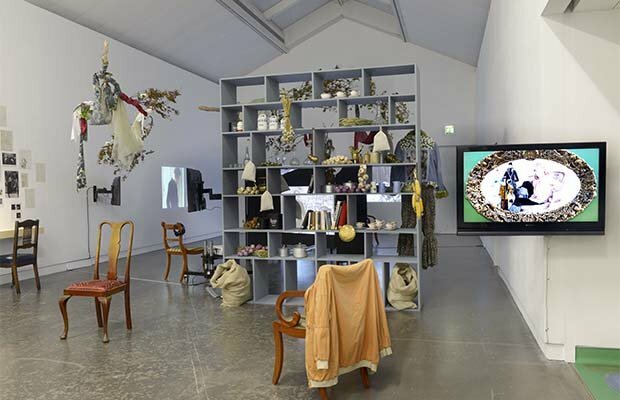 CCA, Glasgow, until Sun 27 Jan.